← Happy birthday Bastian Schweinsteiger! Happy German football, happy German Eurovision and even happy German rugby! Enter an Aussie bloke. He is an extremely talented rugby player. This sportsman also happens to be a descendent of a British aristocratic family. He has helped to front a high profile gay rights campaign in Australia and models undies in his spare time. On the eve of a big final he wrote some poetry to inspire his teammates. He also helped inspire his club to victory on the field to win that final with a man of the match performance. No, I am not writing a character profile for one of the great Australian soaps Home And Away or Neighbours! Colourful character he may very well be but Adam Ashley-Cooper is very much the real rugby deal. After a decade of waiting to play a game in the finals phase of Super Rugby competition, the script was written for the 30-year-old to be the hero of the hour on Saturday when his team were hoping to end their Super Rugby drought by beating New Zealand rugby aristocrats the Crusaders in Sydney’s Olympic Stadium. And boy, did Ashley-Cooper step up for that guts and glory fairy-tale finish. It was widely reported in the build-up to the match that the back wrote a poem for his Waratahs colleagues. Ashley-Cooper read the poem aloud, which sounds like it was an epic as it took him 20 minutes to recite. It was an emotionally charged affair as prop Sekope Kepu explained before the match, “It certainly sent shivers down my spine, it’s pretty emotional stuff, and you can’t get any better than that. This speech was part of the Waratahs now winning team culture under former Leinster coach Michael Cheika, where in the weeks leading up to the Super Rugby semi-final and final, senior players gave motivational team talks. 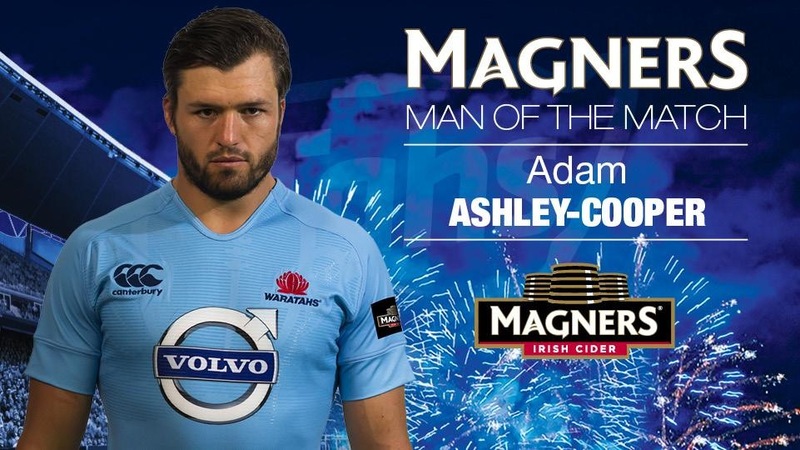 The Waratahs and Ashley-Cooper’s special efforts were extended to playing field on Saturday. His two tries fell into his trademark style of drifting sideways to dummy before receiving the pass to fend off the defenders, to then touch down in style with a fist pump and wag of his finger. This was a fitting fashion for the 94 test cap veteran to help collect some much longed for Super Rugby silverware as Ashley-Cooper has been one of the Wallabies most consistent players earning the nicknames “Mr Versatile” and “Mr Fix It” due to his ability to play with class at outside centre as he did on Saturday, at fullback or on the wing. Ashley-Cooper was a relative late comer to rugby, first starting to play at age 15 while growing up on the Central Coast in New South Wales. That part of the world may seem a long way from Westminster but the Wallaby can trace his roots back to the illustrious Ashley-Cooper family, Earls of Shaftsbury as he is descended from the Sixth Earl of Shaftsbury, Cropley Ashley-Cooper (1768-1851). The Earl served as a Member of Parliament for over 20 years and was himself descended from William the Conqueror. Wouldn’t Ashley-Cooper, Earl of the rugby field, be an excellent candidate to trace his roots on hit genealogy television programme Who Do You Think You Are? Ashley-Cooper has become a huge fan favourite not just because of his reliability and adaptability as a player but also due to his lively persona on social media. A fair bit of this centres around his bromance with former Waratahs and Wallabies teammate Drew Mitchell and the accompanying banter. The first tweet sent by Ashley-Cooper after the Super Rugby victory was a photo of himself posing with the trophy in the dressing room. He was also proudly wearing his medal accessorised by just his jocks and socks! This leads to the underwear modelling string to Ashley-Cooper’s bow. He was signed up last year as brand ambassador to Jockey following in the footsteps of Dan Carter and the All Blacks. No doubt the brand were delighted to see he was sporting a pair of their briefs in his celebratory photo. Ashley-Cooper has also used his high profile for the greater good backing drives for blood donation and supporting a charity for acquired brain injuries. He has gained admiration as an anti-homophobia in sport spokesperson person. 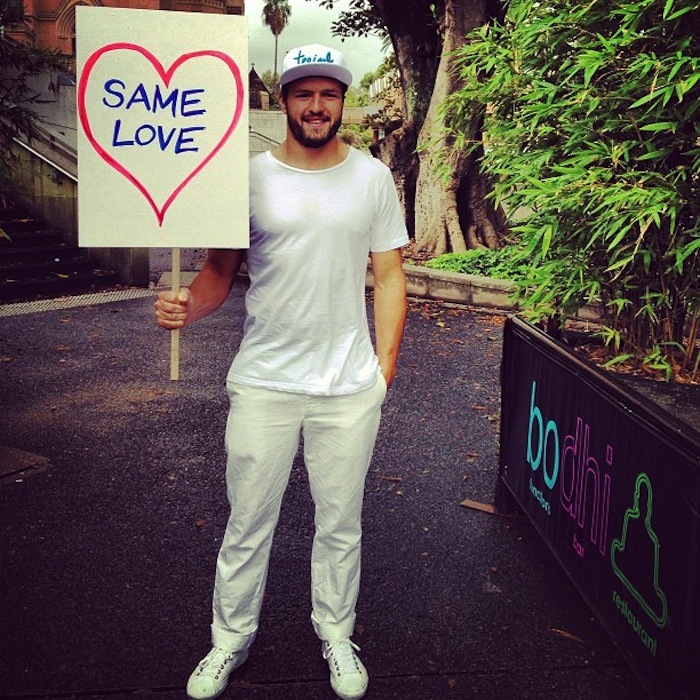 After taking part in Sydney’s Mardi Gras Pride parade in 2013 making a stand for marriage equality in Australia, he has spoken out for the Out On the Fields campaign and to promote the Bingham Cup (the world’s biggest LGBT rugby tournament), taking place in Sydney later this month. Ashley-Cooper joins fellow Wallaby David Pocock in supporting gay rights and marriage equality. Both these players along with the likes of Quade Cooper and James Horwill represent a generation of Wallabies who as well being great players on the field show character and personality that help add extra appeal to a sport that must compete in Australia’s extremely crowded sporting marketplace against the likes of Rugby League, Aussie Rules, Cricket and soccer. The Wallabies may be talented and have likeable players but a certain black clad neighbour from across the Tasman has been keeping them in the shadows for the last few seasons. The Waratahs’ victory must have held extra sweetness due to the fact it was over Kiwi opposition. With the Wallabies returning to Olympic Park in just under two weeks to take on New Zealand, Ashley-Cooper will be just one of a team of Aussie blokes determined to tear up the script of recent seasons and write themselves into rugby history. PS I know this is my second post that mentions Jockey collaborating with rugby stars but I promise it is just a coincidence! I am not just into rugby writing for that kind of stuff nor do I secretly work in underpants marketing!